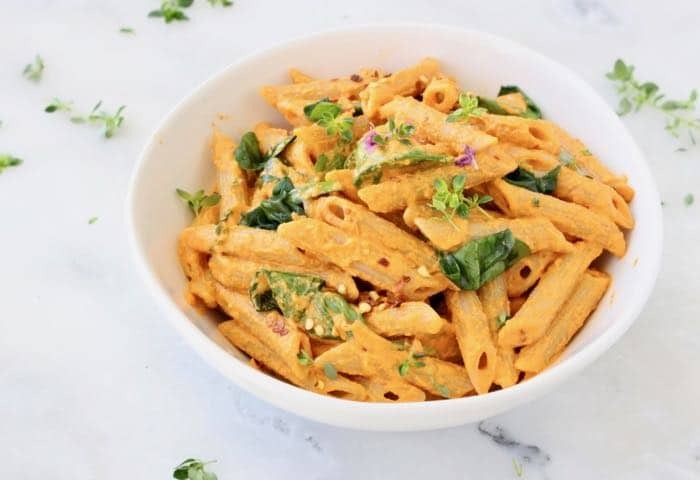 The best ever, creamy vegan roasted red pepper pasta sauce tossed with whole wheat penne and lots of healthy baby spinach. 100% WFPB oil-free recipe, easy like Sunday morning! If you’ve been looking for the ultimate creamy pasta sauce that is also vegan and oil-free, well look no more my friends! I got you! This has instantly become one of my absolute favorite sauces of all times. 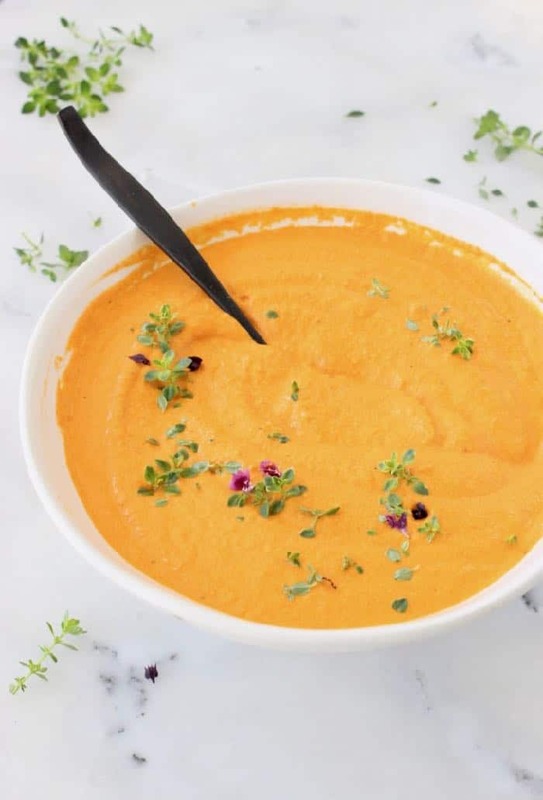 Quilt free deliciousness that starts with soaked cashews blended together with sweet and smoky roasted red peppers, garlic and nutritional yeast until silky smooth and perfectly thickened with tapioca. No cream, no roux, no added nothings. A thick creamy sauce calls for a short shape pasta with ridges that is able to hold on to that goodness. I chose whole wheat but there are many gluten-free pasta shapes out there you can choose from as well. If you wanna go for a long noodle type I’d suggest linguine or fettuccine over spaghetti, even raw zucchini noodles, again something that can stand up to that sauce. 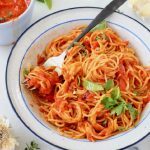 This Vegan Roasted Red Pepper Pasta is To Die For! There are many recipes that intersect between by kitchen counter and my laptop, many of them will be eaten on the spot and never make it to the server. I try to stick to posting only the very best, the ones that make their appearance over and over again, and this one is most definitely one of those. If you roast your own peppers for this recipe you are a boss on top of your game. However, If in a pinch on a Tuesday, feel free to use the jarred organic variety packed in water. Make sure to read the label so you don’t find yourself at home with peppers packed in oil for an oil-free recipe. Yikes! You’ll be so mad at yourself believe me, I’ve done that and there was no forgiveness for self. Ha! 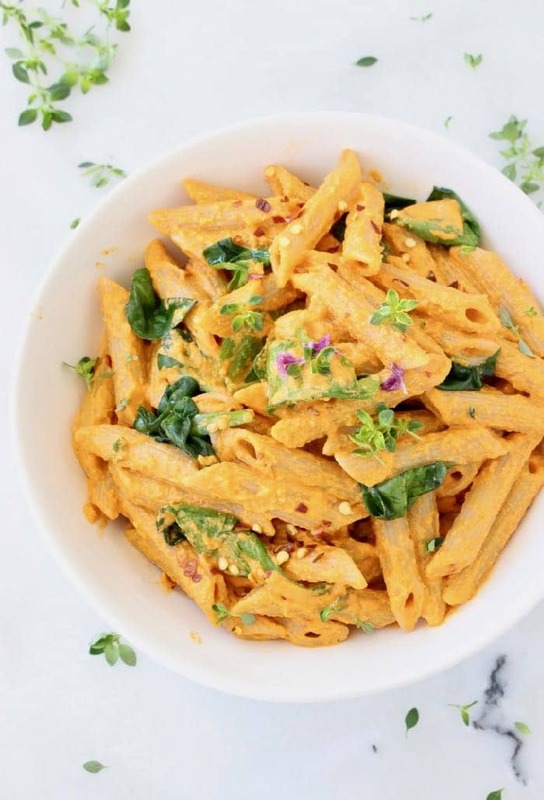 This creamy roasted pepper pasta is everything! good to know: bell peppers belong to the capsicum family, the riper the pepper the more nutritious it is and the sweetest the flavor. They are rich in vitamin A, C, K potassium and lycopene. P.S. As always, if you make this this recipe remember to come back here to rate it, snap a photo and tag us with #VeggieSociety on Instagram. 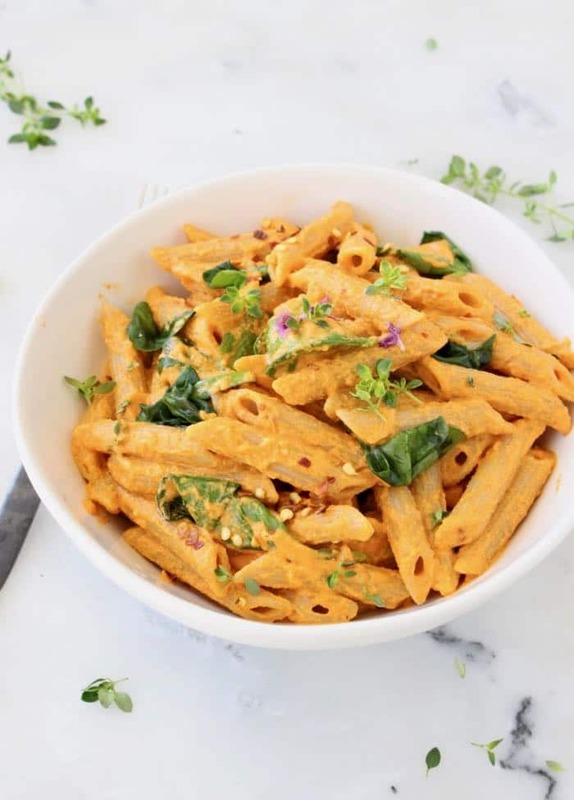 the best ever, creamy vegan roasted red pepper pasta sauce tossed with whole wheat penne and lots of healthy baby spinach. Rinse the cashews than soak them overnight (or at least 2 hours) in a jar covered by 2 inches of water. 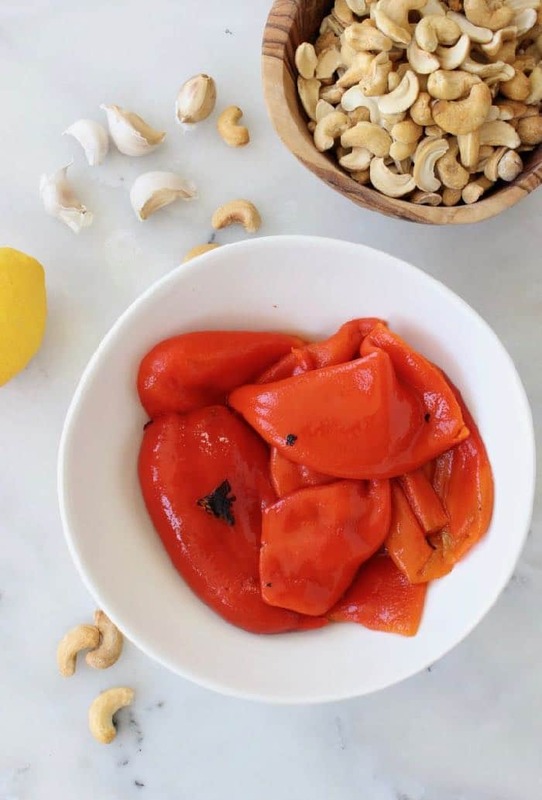 Drain the cashews and process them together in your blender with the roasted red peppers, nutritional yeast, tapioca and water until silky smooth and creamy. Add a little extra water if needed. Transfer the sauce to a pan and stir in the grated garlic and pepper flakes. Taste and adjust seasonings with a pinch of sea salt and more pepper flakes to your liking. Bring to a simmer on medium flame and cook a few minutes until thick and creamy to your liking. Meanwhile cook the pasta according to direction on the package, until al dente. In the last minute of cooking add the spinach and cook until wilted. Reserve 1 cup of the cooking pasta water then drain the pasta in a colander. 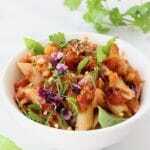 In a large mixing bowl combine together the pasta, spinach and roasted pepper sauce. Add some of the reserved pasta water if you like to thin out the sauce. Serve warm or cold. 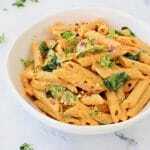 I've also made this with the Beyond Meat Italian sausage and it was a total hit. Definitely try that on a night you'd like to indulge a bit. This looks absolutely delicious! 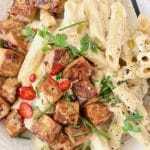 Is there an alternative for the cashews in this recipe? Thank you Kim! You could do walnuts or pine nuts instead If you prefer. This was absolutely delicious and a new favorite recipe recipe. I can’t belive it’s vegan and WFPB, fantastic recipe, thank you for sharing.